This work, one of the very earliest printed books in Manchu, is a compilation of twenty-one episodes dealing with Chinese history, and more particularly the history of the Jin dynasty (1115-1234), ancestors of the Manchu Qing dynasty (1644-1911). A few brief notes on Buddhist and Confucian ethics have been appended. 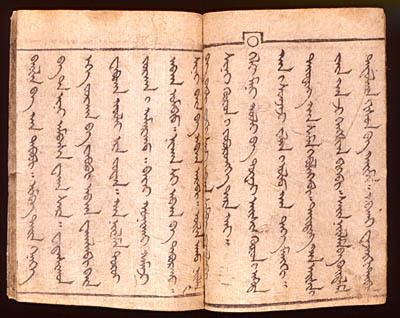 The text, written in ancient Manchu script and spelling, features neither dots nor circles, thus indicating that it was printed prior to the orthographic reform of 1632. The account opens with the sign known as birga, and the beginning of each episode is marked by a circle.The volume, simply bound by means of two twisted pieces of paper, and with neither cover nor title, was printed from wood blocks. The text contains no date or any mention allowing the author to be identified.